Facial Hair Removal for Men and Women Made Easy at Dyanna Spa in N.Y.C. Easy and successful facial hair removal treatments are one of the specialties you’ll find at Dyanna Spa in N.Y.C. Removal of facial hair on women and men is in great demand because so many people simply find it unattractive. For people who want to look their best, unwanted facial hair, which seems to show up in the worst places, is a problem. Imagine being all dressed up to go out on the town and you look in the mirror only to find unsightly hair sticking out of your nose or ears. If you hope to get a goodnight kiss, a dark hairy upper lip and chin hairs reduces the likelihood. Poorly contoured or bushy eyebrows may also be a turnoff. To take care of the unwanted hair on your face, Dyanna Spa offers several treatments using special wax formulas, threading, or electrolysis. One of the best methods of face hair removal is waxing. At Manhattan’s Dyanna Spa, our estheticians are trained to make your waxing experience a quick and painless experience. We have two types of waxing treatments. With our Azulene wax formula, our esthetician applies warmed wax in small sections using a wooden stick or spatula and then covers the area with paper strips. After the wax hardens, she deftly removes the paper strips in the opposite direction of the hair growth, pulling out hair directly from the follicles, along with dead skin cells. For sanitary reasons, there is no “double dipping”. She discards the stick or spatula after each application of wax to avoid contamination. For those men and women with sensitive skin, our day spa uses the Cirepil Blue hard wax formula. Our esthetician applies the low temperature warmed wax to the appropriate area, waits for it to harden, and then simply peels the wax off in the direction opposite your hair growth. Our beauty salon’s waxing treatments last up to thirty days. Threading is a technique originating in Asia and the Middle East and is now very popular in the United States. Although this method of hair removal can be used to remove hair from other parts of the face or body, it’s most popular use is for eyebrows. Eyebrow threading creates the perfect brow line, whether you have a unibrow, bushy eyebrows, or unshapely eyebrows. With just a piece of doubled cotton thread, Dyanna Spa’s esthetician twists it around individual hairs, and then pulls the hair out by the root. This hair removal technique creates a very clean and well-defined eyebrow line. Results last for up to four weeks. Electrolysis is the only FDA-approved method of permanent hair removal. Our N.Y.C. certified electrologists inserts a tiny disposable needle into individual hair follicles where it receives an electrical charge destroying the hair root. It does take several treatments for the hair root to be permanently destroyed, but with each treatment, less hair grows back. Each one of our facial hair removal treatments, waxing, threading, and electrolysis, is perfect for removing hair from the chin, upper lip, cheeks, nose, ears, and eyebrows. Once you receive one of our treatments, you can paint the town red with confidence, and know you’ll probably get that amorous goodnight kiss. Make your appointment now for one of Dyanna Spa’s facial hair removal treatments. Brighten Up the Windows To Your Soul: Eye wrinkle and puffines reducing treatments and Eyebrow shaping at New York / NYC’s Best Spa- Dyanna Body & Nail Spa! There are several things that can add to someone’s beauty and many things that can take it away. At New York’s top rated spa, Dyanna Body & Nail Spa in Gramercy Park, Manhattan, the staff works endlessly to maintain clients’ natural beauty with the best, most luxurious, and most convenient procedures and treatments. So when you are taking care of your face and body, whether you are a man or woman- there’s one key thing you simply cannot forget about: YOUR EYES. Eyebrow threading and waxing as well as eye wrinkle and eye puffiness reducing procedures are a must when battling signs of aging! What do you think people see when they look at you? Is it the beautiful soul swimming behind your eyes or the wrinkles and dark circles that distract from it? Is it the wide awake and ready for life look beaming through your eyes or is it hidden behind bushy eyebrows? If you’re tired of the dark circles, wrinkles, and unkempt eyebrows around your eyes then it’s the perfect time for you to come to Dyanna Body & Nail Spa for a little lid recovery. With Dyanna’s Collagen Eye Treatment, the skin under your lid will become firm to avoid sagging and will replenish nutrients to eliminate the need to retain water. This mask will reduce puffiness and fine lines by nourishing and hydrating the area surrounding the eye. Once you’ve got the skin around the eyes taken care of, take a minute to care for the hair that surrounds it. Throughout time, women plucked, tweezed, waxed and even burned their eyebrows in order to have them assume the shape that women desired. What is gaining great popularity today is the “new” technique of Eyebrow threading. Eyebrow Threading is an ancient method of eyebrow shaping hair removal that originated in Persia but continued to be used in India and a few Middle Eastern countries for centuries. It is a technique that uses 100% twisted cotton thread and pulls lines of hair all at once. It is less painful than waxing and fast. The best thing about threading is that the threads used to remove hairs are so thin and precise, you are guaranteed a perfect shape with no room for error! The technique is done so mathematically correct, that it is much easier to control so that results are flawless, even and perfect for your face shape. Dyanna Body & Nail Spa has been voted by top New York review sites as a Best Spa in NYC for eyebrow threading / shaping, Best Spa in NYC for facials, Best Spa in NYC for Body Treatments, and Best Spa in NYC for Waxing & Overall Hair Removal, so you can feel secure that when you’re trusting your face and body to our experts, you are getting award winning results! To find out more about anti-aging eye and eyebrow treatments at Dyanna Body & Nail Spa or to learn about other beauty treatments please visit http://dyannaspa.com or call us at (212) 955 -2355. Also feel free to contact us to schedule your appointment or consultation online or by phone! Gone are the days when the women stayed home and took care of the house and their appearance, while the men went to work and brought home the money. It’s 2010 and equality means that not only are women a vital part of the work force, but also that men are just as responsible for taking care of the home and even THEMSELVES. That means, that more and more men are taking the time to visit the spa’s and salons to boost their look and overall wellness. According to the International Spa Association, men make up almost 1/3 of all spa goers. Especially in a cosmopolitan city like New York, where your appearance is as important as your skills, even the men are find it inexcusable to let themselves slack off. At Dyanna Body & Nail Salon- Spa in NYC, this is especially true. Men come to spa with their girlfriends, wives, partners and by themselves to relax, rejuvenate and get their beauty on. Modern men are not signing up for sports massages, manicures, facials, body scrubs and waxing as well. What makes this subject of men and spa’s even more relevant right now is that the summer is just a Memorial Day Weekend away so men need to make sure they look their best! WAXING: Removing unwanted hair on your body has to be one of the top priorities these days right before you start baring it all regularly for those weekends on the beach. Having smooth and clean skin is important this summer season, and Dyanna Spa is making it easy and painless. Dyanna Spa offers waxing on any part of the body at very reasonable prices. Our professional technicians will make you feel comfortable and remove hair quickly and pain-free. Dyanna Spa uses hard wax as well as Cirepil Blue Hard Wax, and adheres to a strict NO-Double dipping policy. Dyanna Spa has been voted the best spa in NYC for waxing two years in a row. FACIALS Skincare in not limited to women. It is just as important for men to take care of their skin as it is for women. Compared to women, men are more exposed to problems like blocked pores and black-heads. Men’s skin is very different than a woman’s due to the fact that it is thicker and men run razors across their skin almost every day. Besides that, contrary to popular belief, men have sensitive skin as well, and they need to follow the right skin care regiment. Microdermabrasion facial is beneficial for coping with skin problems. Especially skin problems arising due to prolonged exposure to sun, stress and aging. Aromatherapy facial uses aromatic oils. This facial is the best for relaxing and hydrating skin. Deep Pore facial is a great resource to take care of the problem areas of the nose and forehead; it allows to clean the pores and remove blackheads quickly and effectively. More and more men are enjoying both the skin benefits and relaxation that facial has to offer. NAILS: Last but certainly not least, do not forget about your nails! Neat nails say a lot about person’s hygiene, and yes people do notice. Dyanna Spa offers a new Brazilian Manicure that uses waterless formula along with lined gloves to deeply hydrate your skin and strengthen nails. So come to Dyanna Spa to take advantage of great manicures and pedicures to make your nails strong and shiny, and your skin soft and moisturized. Dyanna Spa has been voted best spa for manicure and pedicure in NYC for the second year in the row. We look forward to seeing you at Dyanna Body & Nail Spa! Are you tired of waxing and plucking leaving your eyebrows looking messy, too thin, or uneven? Tried every salon in New York to get the perfect brow shape but never leave satisfied? It’s time you upgraded your brows to the best salon for eyebrow threading salon in NYC! There is very little doubt that well shaped eyebrows help shape your face, however this is just one part of the importance of having great eyebrows. Did you know that your eyebrows can actually say a lot about you and your personality? Did you know that the shape of your eyebrows might be communicating a false message about what you are feeling? If the eyes are the window to a person’s soul, and then what are the eyebrows?! Perhaps they are the window to your emotional state. Eyebrows are extremely important, not just for their physical function, but they have unique ability to change your face and also give way to facial expressions. Throughout time, women plucked, tweezed, waxed and even burned their eyebrows in order to have them assume the shape that women desired. What is gaining great popularity today is the “new” technique of threading. Threading is an ancient method of hair removal that originated in Persia but continued to be used in India and a few Middle Eastern countries for centuries. It is a technique that uses 100% twisted cotton thread and pulls lines of hair all at once. It is less painful than waxing and fast. The best thing about threading is that the threads used to remove hairs are so thin and precise, you are guaranteed a perfect shape with no room for error! The technique is done so mathematically correct, that it is much easier to control so that results are flawless, even and perfect for your face shape. Currently, threading has been gaining popularity in the West quickly and there are millions of women who swear by it today! As opposed to waxing, threading is much gentler, because it does not peel the top layers of skin or traumatizes it. Threading is highly recommended by dermatologists for people who use acne creams/treatments and for those with sensitive skin, pregnant women and even those who simply do not like the pain of waxing. Dyanna Spa in Gramercy Park, New York provides a great variety of hair removal services including the new popular EYEBROW THREADING. We have highly trained and licensed technicians whose mission is to provide you with top of the line service at your comfort and as pain free as possible. Dyanna Spa has top of the line technicians who were specifically trained in EYEBROW THREADING, and they are ready to add you to the list of their thousands of satisfied clients! VALENTINE’S DAY EASY 3-STEP PREP GUIDE: Show Some Love- to YOURSELF! Streets adorned with images of cupid, crimson hearts, and roses remind us that Valentine’s Day is just around the corner. That means it’s crunch time to get yourself all dolled up for the the romantic evening you have been planning all year long. Skip the fuss and week-long pampering routine to prepare for the date. Your sweetie loves you for who you are, so be true to yourself and choose a few services that will help you feel your best while simply enhancing your natural beauty. Here is our quick 3-Step Glam Guide for looking and feeling like a Perfect 10 this V-Day! 1) FACIAL: Your face is going to be the first thing he sees on V-Day, so put your best face forward with a facial to suit your skin type! Dyanna Body & Nail Spa has a wide variety of facials to meet different your specific skincare needs. Battling blemishes and acne-prone skin? The Acne/Problem Skin Facial with Propolis and Blemish Control Mud Mask can do wonders just in time! Looking to completely rejuvenate your face and eliminate fine lines and wrinkles? The Diamond Microdermabrasion can take up to 10 years off your overall look. All facial products used by the Dyanna’s aestheticians deliver powerful therapy, revitalizing your skin and spirit, and further enhancing the feeling of well-being. Your skin and contours will be left soft, fresh, vibrant and youthful- meaning your best feature is on A-Game for V-Day. 2) WAX: There’s no better way to feel confident with your partner than to KNOW your skin is silky-smooth and hair-free. That’s why we strive to provide you with the best hair removal service in NYC. Having won best of NYC Spa for Waxing, Bikini & Brazilian Wax, and overall hair removal– our specialists strive to give you the most comfort and lasting results with the least pain. Our special azulen aloe wax formula works effectively to remove hair gently, safely and quickly. Our very strict no double dipping policy protects you from unwanted consequences. Just in time for Valentine’s Day we are proud to introduce Cirepil Blue Hard Wax to our waxing family! This strip-free method of hair removal, allows the wax to be applied to skin directly and once hardened it is simply, quickly, and less painfully removed from the skin by hand. This wax is perfect for people with sensitive skin who are prone to irritation and ingrown hairs that other waxes leave behind. 3) MANICURE/ PEDICURE: Last, but not least, don’t forget about those nails! Your nails say a lot about your overall hygiene, so even though your face and skin all around may be smooth and glowing, unkept nails can be a deal breaker! 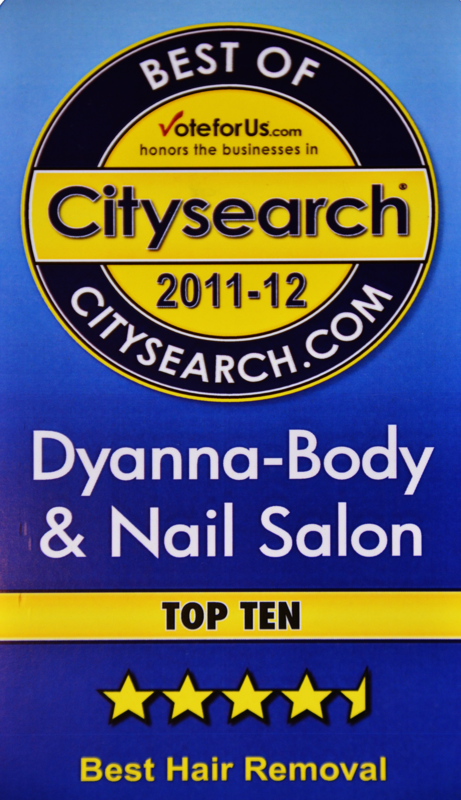 Dyanna Body & Nail Spa has also been voted as a top salon in New York for manicures and pedicures in 2008 and 2009. This Valentine’s Day try our newest Brazilian Manicure and Pedicure, which we are proud to be the first spa in Manhattan to utilize! This water-free technique deep moisturizes your hands and hardens your nails to make them stronger longer. Just 3 simple procedures is all you need to bring out your natural beauty and make your loved one’s heart skip a beat this Valentine’s Day!